Deutsche Post daughter DHL Express announced they will buy eight A300-600 freighters from Air Hong Kong and return them to the carrier on lease basis. The contract, effective 1 January, 2018 runs for a period of 15 years. Part of the accord is that DHL sells their 40 percent stake in Air Hong Kong to majority owner Cathay Pacific, as already announced weeks ago. Meanwhile, DHL Global Forwarding and Russian carrier AirBridgeCargo have commenced with a pharma cooperation after successful completion of a multi-modal shipment trial. DHL Express stresses that the new agreement on the freighters will provide a stable revenue stream to Air Hong Kong and a predictable cost base for the integrator. It will provide DHL with the same service and access to Air Hong Kong’s capacity as does the current contract, but allows for greater growth, flexibility in aircraft deployment and route selection to support the integrator’s express services in the APAC region. Despite their sales of own shares to Cathay, Air Hong Kong will remain an important partner in DHL’s Asia network that utilizes 800-plus daily flights to the U.S., Europe and within the APAC region. 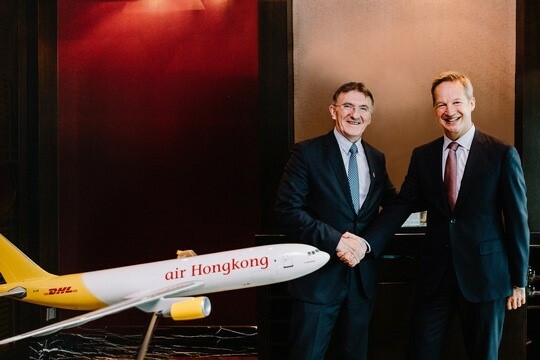 Ken Allen, CEO, DHL Express states: “Air Hong Kong has provided the backbone of our air express capabilities in Hong Kong for 15 years since 2002. And the latest agreement with Cathay Pacific will allow it to reach even greater heights as we consolidate its operations for maximal efficiency and availability.” The executive went on to say: “Asia is expected to experience exponential trade growth and our renewed block space agreement with Air Hong Kong forms a natural complement to DHL’s broader growth strategy in Asia Pacific to meet continually strong market demand.” Thanks to the deal now signed, the integrator will be able to consolidate the freight carrier’s operations for achieving maximal efficiency and availability. With Air Hong Kong becoming a wholly-owned subsidiary of the Cathay Group, and with the block space agreement in place, “these will enable us to invest in the long-term success of Air Hong Kong, which benefits from the prospering express air cargo market in the region, and capture the abundant business opportunities that are prevalent,” stated Cathay CEO Rupert Hogg. Only recently DHL Express has announced the enlargement of its facilities in Hong Kong, adding 8,000 sqm of space as well as new technologies including automated X-ray inspection machines and material handling systems to its hub. When operating at full capacity, the annual throughput of the expanded CAH is expected to go up by 50% to 1.06 million tons per year. 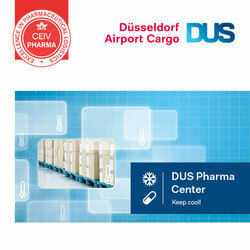 In a separate announcement, DHL Global Forwarding (DGF) and ABC have stated that they completed a multi-modal shipment trial, delivering 400-plus kilograms of vaccines from Moscow to Miami, Florida, utilizing an active cool container. 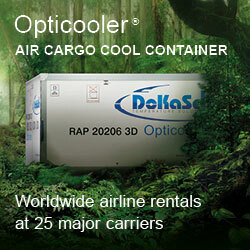 The Envirotainer provided RKN is a certified ULD container which ensures the integrity of pharma products by maintaining constant temperatures along the entire transport chain, depending on customer requirements. The total service rendered covered delivery, leasing and guaranteed customs clearance for the customer as well as ensuring a minimum transit time and the elimination of temperature risk.